I really get a kick out of early comic strips about cars. The cartoonist of 1902 was still coming up with an iconic cartoon image for the new transportation medium -- some cartoonists drew them essentially as cubes with the driver perched precariously on top, others hadn't figured out how to reduce the complexity of the automobile to a cartoon and drew them in almost blueprint detail. George Herriman, in Professor Otto and his Auto, had the iconic form pretty much down pat here in 1902 -- four giant balloon tires with an inverted bathtub in the middle. This cartoon shorthand would stay pretty much the standard for decades, even though the actual vehicle designs varied widely in that time. Professor Otto and his Auto roared to life in the New York World on March 30 1902, and lasted at least until December 28 of that year. Ken Barker's World index is spotty on 1903 dates, as the microfilm he was working with failed to include comic sections for a lot of 1903 Sundays. 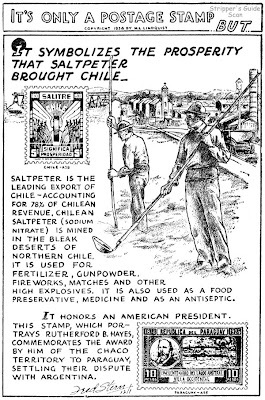 Does anyone know of a 1903 installment of this strip? Here's one of those features that causes me fits for the Stripper's Guide index. Is it a cartoon panel, or is it just an illustrated newspaper column? It's certainly set up like a panel cartoon, and it's hand-lettered like a cartoon panel, but it's a pretty fur stretch to call the illustrations cartoons, and the illustrations are really just that - they are not really an integral part of the storytelling. My decision was that It's Only a Postage Stamp ... But did not qualify for the Stripper's Guide index. Which is a good thing, because the feature was never advertised in E&P, there's no syndicate credit on my samples, and all I have are a small stack of samples from 1935 which were run on a space available basis by the newspaper. Not exactly what you would call solid ground for an informative index entry. I love this sort of comic. Little kids can be drawn in and learn exotic things about the world from simple items near at hand. Facinating. Thanks for posting this! Yup, it's too bad that this sort of material is all but extinct in newspapers. Hobby features (stamps, coins, model-building, etc) seemed to pretty much disappear back in the 60s. And of course it gave kids one less reason to read the newspaper. Smart thinking, newspaper editors! 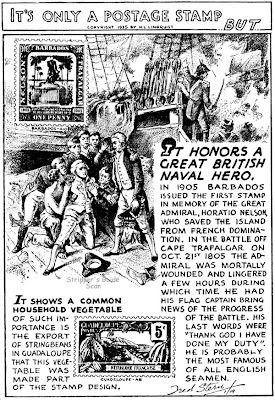 Looks like one of many series of newspaper filler cartoons that were offered free to smaller papers. There were still a few like these around when I worked at a pennysaver back in the 80's but most of them were thinly disguised advocacy items by that time ("STUPID LAWS: In some states, lawmakers are actually considering taking away your right to smoke in hospital rooms!"). Some I remember from earlier, growing up in the midwest, would be farm-related, possibly produced by extension services or co-ops. Could be, though I don't know what they would be hawking with the stamps angle. Some of those freebies, though, as I've discussed in other posts, are tough to pin down as to their covert purposes. Ever since they stopped letting me smoke in hospital rooms I'm in much better health. Didn't quit smoking, just stopped going to hospitals. Gustave Verbeck's first known comic strip series, pre-dating his classic The Upside-Downs of Little Lady Lovekins and Old Man Muffaroo, was Easy Papa. It was a rather undistinguished effort despite the delightfully kooky art. Easy Papa sported the standard issue pair of noisome kids playing pranks on an unflappable pater familias. (Sorry for the high-falutin' verbiage, but I'm running out of ways to say "Katzies rip-off"). Easy Papa ran 5/25/02 - 2/1/03 in the New York World. Not too curiously, it was missed by no one, including Maurice Horn who fails to list its existence in the World Encyclopedia of Comics, where he claims that Verbeck only penned three comic strip series. The number is actually five, but I'll leave the fifth as a mystery until some later date. Oh, and if the above strip has you baffled, the dish called Welsh rabbit has nothing to do with our wascally friends of the animal world. It is actually a melted spiced cheese sauce served over toast, more properly called Welsh rarebit. This lower class delicacy was popular back in the day as a very inexpensive meal. The corruption of rarebit into rabbit was meant sardonically as an indicator that if you were eating this goop you probably couldn't afford the price of a proper supper with meat in it. Oh, my... what a great quality linework. How did you get that? Have you yet been contacted by the manager of the Lambiek site about using some of your stuff? I am sure they'll want to add this to their Gustaf Verbeek info. Thanks for the great strip. I have some information on Verbeek (taken from Rick Marschall) and three samples of his Loony Lyrics of Lulu at my Nonsense in the Early Comics site. Thanks for the link, Marco. I've added it to the link list on the blog. The best drawn comic strip of all time had an ignominious coda in 1947, when Winsor McCay's son took a last stab at revitalizing the Little Nemo franchise. 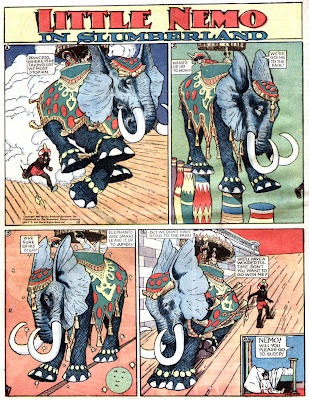 In association with the Richardson Feature Service, Junior created 'new' Little Nemo comic strips by reformatting and recaptioning old panels from the original series. The American comics section in 1947 would devote at best a tabloid page, or a half broadsheet page, to the feature, certainly a slap in the face to McCay's original glorious Sundays. Junior tried to rework his father's masterpieces, using just a few panels to tell a highly curtailed and simplified version of the story in the original strips. The result, while still breathtaking regardless of the maimed artwork, was a mere shadow, and an unfit tribute to the glory that was Little Nemo. The strip didn't sell well, and it debuted on March 2 1947 in a mere handful of papers. The last known appearance was in the Long Island Press on December 28 of that year. Was it this same stuff or something different that Bob McCay did for the comic books of the 1940s? I'm not really trustworthy on comic book questions, but I do know that the material in Cocomalt Comics was new art by Bob (who really could ape dad's style pretty well). As for other appearances, I dunno. Kate Carew was quite the big-time New York celebrity in the first decades of the 20th century. In addition to her cartooning, she did a lot of feature writing for newspapers, and her byline was always displayed prominently (much as today's sample strip does). The multi-talented Carew specialized in feature stories about celebrities and bigwigs, usually accompanied with Art Nouveau-influenced caricatures. 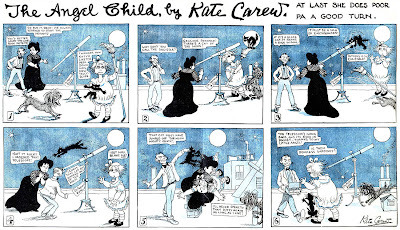 Carew's only continuing comic strip series known to me is The Angel Child, though OSU also credits her with a 1903 strip titled Handy Andy which I've not seen (anyone have a sample or know where it ran?). 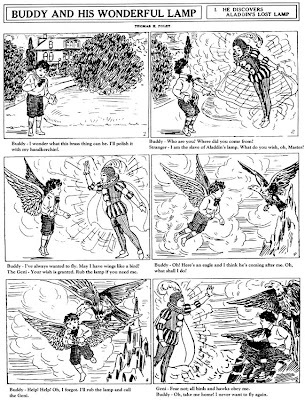 The Angel Child was a fairly typical mischievous kid strip, with the minor deviation that the little girl always ended up getting praised for the unintended positive consequences of her pranks. The final panel always had the child being offered a treat by her parents, and our sample strip is particularly interesting because the treat tendered is a can of sardines -yum! No chocolate cake for me, thanks, I'd rather have the salted chum. The Angel Child had a healthy run in the Sunday comic section of the New York World. The feature ran 4/27/1902 - 2/19/1905. Here's an excellent page that has a capsule bio and interview with Carew. I looked all over your blog and it says in more than a few places things like " I'd love to hear from you!" and "please contact me." but I can't find an email address anywhere. Not much of a sample, and the cited dates don't appear to work for it being from the World (too bad their listings don't tell us the paper!). Although the film of the New York World is missing many 1903 Sundays, I was able to supplement the Pulitzer info based on a good run in the St. Louis Post-Dispatch film. 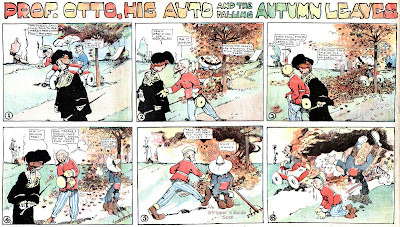 That film had all the Sundays in September-October and none of them included this strip. So the problem remains -- where did this strip run? Here's another of the back page comics that were a regular feature of the Sunday Minneapolis Journal children's section. Tom Foley wrote and drew Buddy and his Wonderful Lamp October 9 1910 through February 19 1911.